As its name implies, Castaway Island is a water paradise. 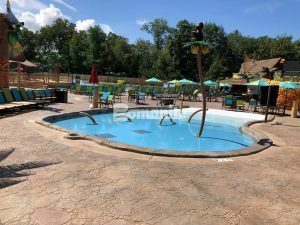 It is an oasis with beautiful grounds, a summer breeze, and all the water rides and fun the kid in you desires. 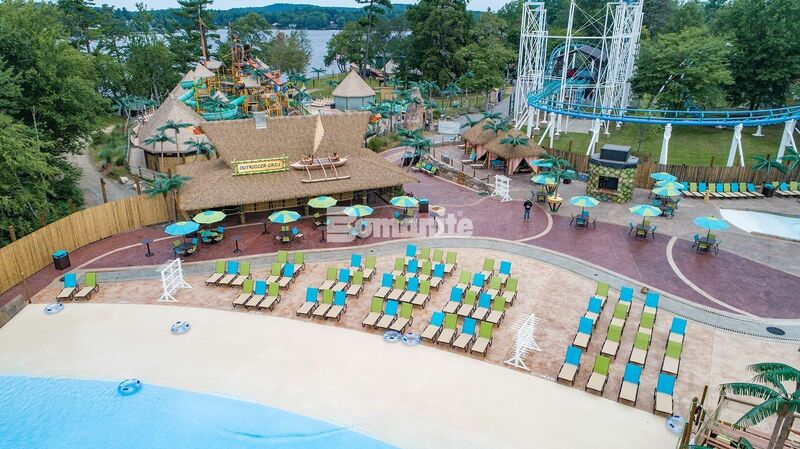 Canobie Lake Park’s Castaway Island is the perfect close-to-home island getaway Amusement Theme Park for residents of New England. 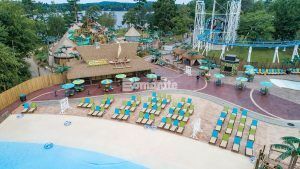 The expansion created a huge new water park featuring a 60′ tower with three water slides, a Tidal River (think lazy river but with waves), a kid friendly lagoon, a Rain Fortress, a Caribbean inspired restaurant with tiki bar and private cabana rentals that include a television, refrigerator and lockers. 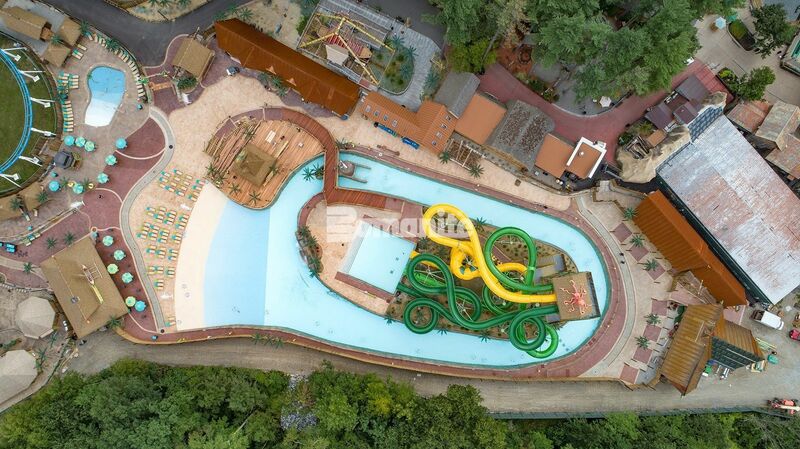 This 100 year old family operated park has been keeping up with the times with renovations and updates throughout the years. 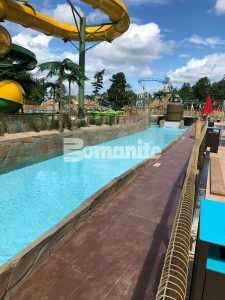 Bomanite licensee, Harrington Bomanite has been a part of those additions for more than 30 years and received the 2018 Bomanite Outstanding Project Grand Award and the 2018 Best Imprint Systems Gold Award for this current expansion project. 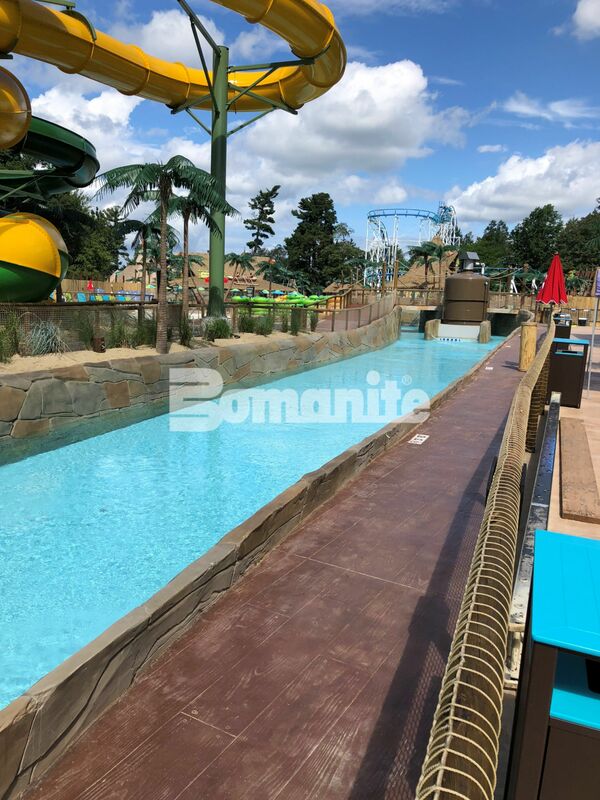 Harrington Bomanite has installed many upgrades and enhancements throughout the park and was presented with its greatest challenge of the “Tidal River Project” an addition to the 45,000 square foot Castaway Island expansion. 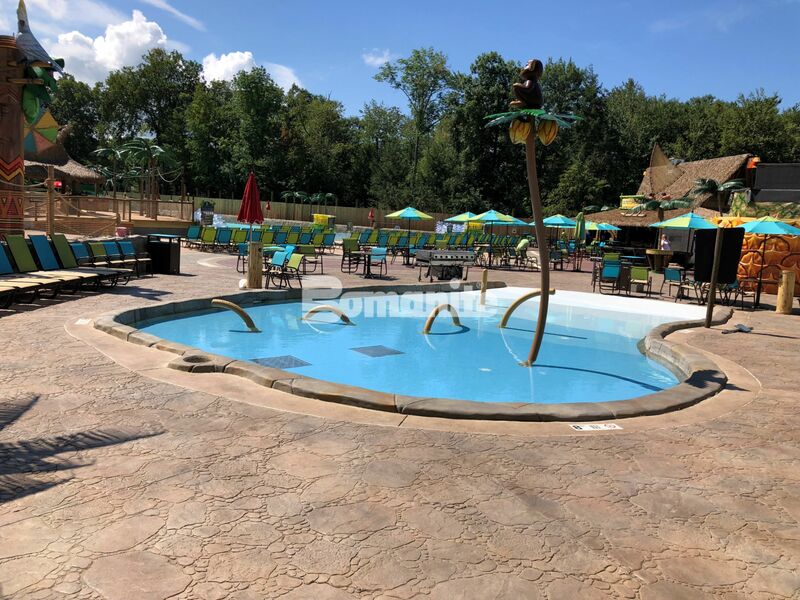 The overall renovation using the Bomanite Imprint Systems included multiple Bomanite stamped concrete patterns and color hardener and release agent colors installed as the decking, plaza, restrooms and water areas. The most challenging aspect was to achieve a drainage system in the 2+ acres site, that satisfied state and local environmental concerns, while at the same time maintaining aesthetics demanded by the owner (and designer) Raymond Captell. Pavers were not part of the drainage solution. 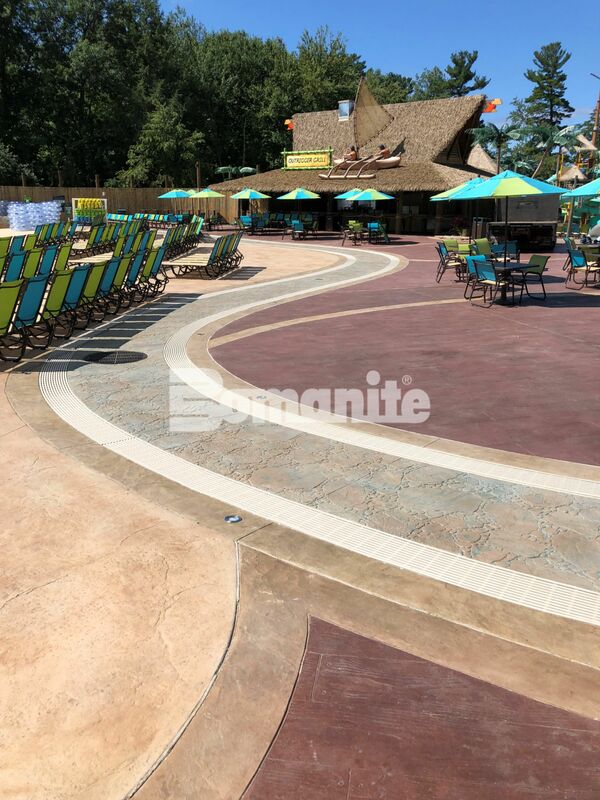 After months of brainstorming, Captell came up with an 8’ wide “meandering brook” concept of stamped concrete. 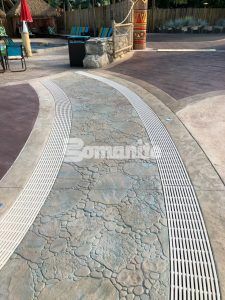 The 8’ area was designed with a 4′ wide center area of the Bomacron Garden Stone pattern, then a 12″ wide drain grate on each side, which in turn was bordered with a 12″ Bomanite Textured Border. Below this 8′ wide area would be a 4′ deep engineered system of graded aggregates for drainage. The challenging part for Harrington Bomanite was not just the pouring and stamping, but the forming. Harrington Bomanite accessed the design perimeters and was able to figure the best way to achieve Captell’s winding waterway concept and bring it to life with a custom aqua blue color hardener to give it the final appearance of water in a real-life brook. In the end, the two serpentine drains, totaling 380 linear feet, were able to infiltrate storm water and minimize runoff, while at the same time adding another aesthetic dimension to the overall deck. The custom blue colors were also used in several tones and shades to mimic the ocean in the water reservoir and bathroom areas. Restroom concrete floors were textured with the Bomacron Sandstone Texture imprint and the bottom of the Tidal river with the Bomacron Light Slate Texture imprint. The beach areas were simulated with the Bomacron Regular Slate Texture and Light brown tones of Color Hardener and Release Agent to get that perfect sandy beach vibe. One final touch in creating that Tiki-resort design is the Bomacron 11.5” Boardwalk pattern running throughout the resort including the Lifeguard walk, thus making it the perfect Island getaway. Read more about this project on the corresponding Bomanite Blog and the Bomanite Project Profile.